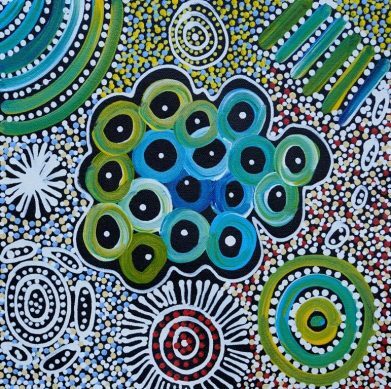 Janet Golder Kngwarreye is an Anmatyerre artist from Mulga Bore on the Utopia Homelands. The artistic line in her family runs deep. Her grandmothers are esteemed Utopia artists Polly Ngale and Angelina Pwerle, her uncle is Greeny Purvis and her sister Belinda Golder Kngwarreye is also an accomplished artist. Janet began painting in 1987, learning her skills from family members and taking on the subject matter that was familiar to the women artists in her family group. These include the Awelye Women’s Ceremonial Body Paint and the Bush Yam Leaf designs and stories as well as Bush Medicine and Mountain Devil Dreaming. In recent times Janet has developed further stories based around the women’s cultural practice on Country, combining imagery of bush tucker along with features of the Utopia landscape. Janet Golder Kngwarreye is highly skilled in her use of colour with her paintings often fusing black and white design with colour elements. Janet has exhibited in galleries around Australia and internationally. Aboriginal art status – Recognised artist.